I invite you to become a friend and a principal client. After graduating from South Plains Jr College in Levelland Texas, and adding a degree in Arts Government from Texas Tech University, in December 1971, I moved to Tahoka Texas to be the assistant cashier at First National Bank for 4 years. After returning to college and taking additional hours in accounting I took the C.P.A. Exam then moved to Hereford Texas to work as an accountant for Cotten & Warrick C.P.A. 's for seven years. I received my C.P.A. licence in November 1981. 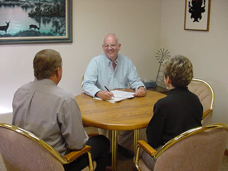 Moved to Wheeler Texas in 1984 and worked for Dickey Cory & Co. Certified Public Accountants for one Year and then purchased the Wheeler Practice from them and have owned own practice in Wheeler since 1984. I particularly value and take pride in the many long-term client relationships I have. It has been gratifying to participate in the growth of many clients who acknowledge the highly personal service and commitment to integrity and quality that I provide. I offer the special dedication, competence and scope of services. I represent corporate, individual and fiduciary clients before the Internal Revenue Service on various tax issues. My expertise in these matters has yielded excellent results. My commitment is to provide cost-effective service to my clients and thus build and retain long-term relationships. My clients are aware of my availability and readiness to furnish a broad range of resources and expertise. If you are interested in the advantage of becoming a principal client, I welcome the opportunity to explore the ways I can develop a mutually satisfying and profitable relationships. Upon retention I review a client's prior tax filings to identify possible tax strategies. As part of such reviews, I often have discovered tax file errors made by predecessors. To correct such errors, I have prepared claims for substantial tax refunds for various entities.